Se, na Faculdade, em vez das secas descomunais que apanhei em Psicologia Educacional a falarmos de estágios de desenvolvimento que em nada de refletem ou aplicam na escola, tivessemos falado de coisas bem mais úteis e destas matérias, eu teria sido uma gaja muito mais informada e atenta. E, provavelmente, não teria chumbado à cadeira e ter que a repetir na época especial - mas isto já são os maus fígados a falar. Adiante. Contra mim falo, a mim me atinjo em parte pois também tenho que obedecer - ainda que em parte - ao sistema. Tento sempre fazer algo diferente, algo que promova a aprendizagem através de outras vias, algo que fique na lembranças dos miúdos - e graúdos - que os possa ajudar na utilização de um conteúdo na vida real. Mas, confesso que, nos moldes atuais, a avaliação tão formal é algo que me dá imenso trabalho - a preparar e a fazer e a sentir-me injusta, em muitas situações, que não me permite muita flexibilidade, que não me deixa fazer algo diferente para cada aluno. E que me dá ainda mais que fazer quando tenho de preparar as piolhas para isso... Porque com ou sem necessidades especiais, há sempre - sempre - avaliação... Formal. Da que se converte em percentagens e usa números. E nem sequer vou dar a minha opinião acerca dos quadros de mérito ou rankings, pelo bem da minha sanidade mental e dos meus nervos. Não sou eu quem manda, eu não governo nem faço escola em gabinetes... Mas sei com o que lido. 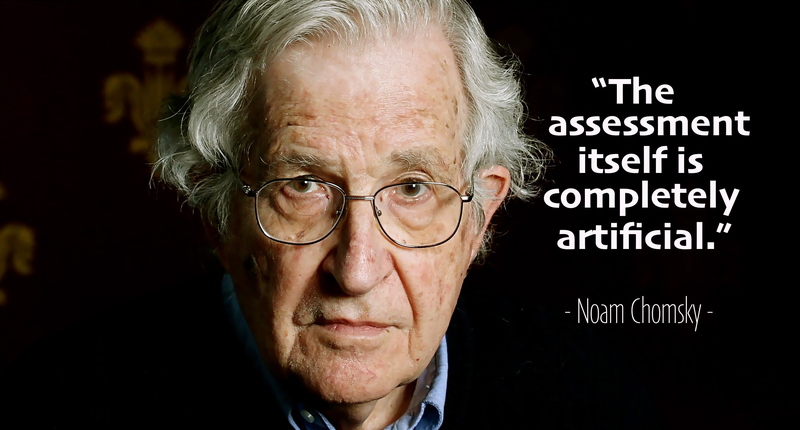 The following is a partial transcript for an interview with Noam Chomsky uploaded to youtube by The Progressive Magazine. “You take what is happening in education. Right now, in recent years, there’s a strong tendency to require assessment of children and teachers so that you have to teach to tests. And the test determines what happens to the child and what happens to the teacher. That’s guaranteed to destroy any meaningful educational process. It means the teacher cannot be creative, imaginative, pay attention to individual students’ needs. The student can’t pursue things, maybe some kid is interested in something, can’t do it because you got to memorize something for this test tomorrow. And the teacher’s future depends on it, as well as the student. The people sitting in the offices, the bureaucrats designing this, they’re not evil people, but they’re working within a system of ideology and doctrines that turns what they’re doing into something extremely harmful. First of all, you don’t have to assess people all the time… People don’t have to be ranked in terms of some artificial [standards]. The assessment itself is completely artificial. It’s not ranking teachers in accordance with their ability to help develop children who will reach their potential, explore their creative interests. Those things you’re not testing. So you are giving some kind of a rank, but it’s a rank that’s mostly meaningless. And the very ranking itself is harmful. It’s turning us into individuals who devote our lives to achieving a rank. Not into doing things that are valuable and important. It’s highly destructive at the lower grades. This is elementary education, so you are training kids this way. And it’s very harmful. I could see it with my own children. When my own kids were in elementary school, at a good quality suburban school, by the time they were in third grade they were dividing up their kids into dumb and smart. You’re dumb if you’re lower tracked, smart if you’re upper tracked. Think of what that does to the children. It doesn’t matter where they’re tracked, the children take it seriously… If you’re caught up in that it’s just extremely harmful. It has nothing to do with education. Education is developing your own potential and creativity. Maybe you’re not going to do well in school and you’ll do great in art. That’s fine. What’s wrong with that? It’s another way of living a fulfilling wonderful life, and one that is significant for other people as well as yourself. The whole idea [of ranking] is harmful in itself. It’s kind of a system of creating something called “economic man.” There’s a concept of economic man, which is in economics literature. Economic man is somebody who rationally calculates how to improve his own status (and status basically means wealth). So you rationally calculate what kinds of choices you should make to increase your wealth, and you don’t pay attention to anything else. Maximize the number of goods you have, cause that is what you can measure. If you do that properly, you are a rational person making informed judgments. You can improve your “human capital,” what you can sell on the market.